Mahatma Gandhi was without doubt one of the most significant figures of the twentieth century. 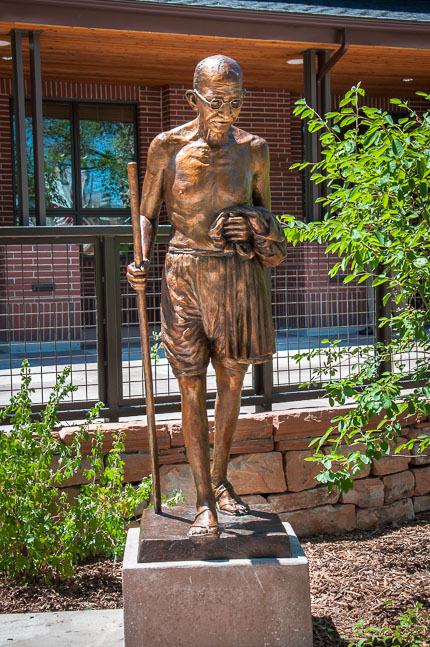 It was an honor to be asked by the Gandhi Alliance for Peace to create a figure of Gandhi which was placed near the new entrance of the Young Women’s Christian Association in Salt Lake City in 2012. Walking forward in quiet resolution and modeled at exactly life-size, his image reminds us that great stature is not necessary in order to accomplish great things. Multiple castings are available. Walking forward in quiet resolution this sculpture of Mahatma Gandhi memorializes on of the most significant figures of the last hundred years. Modeled at exactly life-size, his image reminds us that large stature is not necessary to accomplish great things. Gandhi was not only a figure of import for his own people; he also represents the most important virtues and moral strivings of our own time.